Quality Air Heating and Air Conditioning > Articles > Air Conditioning > Why Is Ice on an Air Conditioner Such a Serious Problem? Why Is Ice on an Air Conditioner Such a Serious Problem? There’s ice on my air conditioner, you think, but that’s probably no big deal. You could not be more wrong in this assumption, though. In truth, ice on your air conditioner may indicate that there is a serious problem with your system, or even lead to such problems if none is already in effect. Yes, your air conditioner is there to keep your home cool and comfortable, but the development of ice does not mean that it is simply working too effectively. If you see ice on your air conditioner in Columbus, OH, contact a member of our staff right away. Let’s start off with a best case scenario. If you notice that there is ice on your evaporator coil, or you see water draining from that area and find that it is due to melting ice, the cause of the problem may be as simple as a dirty air filter in your air conditioning system. The evaporator coil is the point at which refrigerant evaporates and absorbs heat from the air passing over and surrounding the coil. If airflow through your system is impeded by a dirty air filter, the heat absorption process may be disrupted. When this happens, your coil may get too cold. This can cause condensation on the coil to freeze. …but Could Also Be Refrigerant Leaks. A refrigerant leak, obviously, is a more serious matter than a dirty air filter. It is also not a problem that you can resolve on your own. If there is not enough refrigerant in your air conditioning system, your coil may get too cold. This can result in the freezing of condensation mentioned above. Of course, you may also notice that there is ice developing on your refrigerant lines themselves. Your system does not consume refrigerant, so low levels are likely a sign that you have a leak in your system. 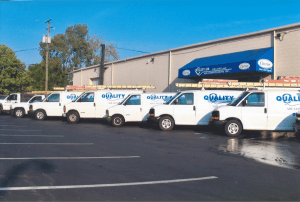 If you suspect the need for AC repairs of any kind, contact the pros at Quality Air Heating and Air Conditioning right away.